Nelson Mandela has referred to Abdullah Ibrahim as “South Africa’s Mozart,” and few would disagree. Born in 1934 in Cape Town, Abdullah Ibrahim’s journey to becoming a conduit of beautiful music began at the age of seven with formal piano lessons at his mother’s church. Alongside Hugh Masekela, he performed and recorded with South Africa’s first premiere jazz group, the Jazz Epistles. In exile in Europe in 1963, destiny would call when Duke Ellington discovered him in a jazz cafe in Zurich, which led to the recording Duke Ellington presents the Dollar Brand Trio (Reprise). Following his mentor to New York where he would later convert to Islam, Abdullah Ibrahim would record prolifically and become one of the leading pianists, composers, and figures in modern jazz. In the 1970s, his songs “Mannenberg” and “Soweto” would be embraced as anthems of protest against Aparthaid South Africa. In the 1980s he would form the septet Ekaya, which would become one of the few successful acoustic jazz groups of this era. The 1990s would see collaborations with big bands and classical string orchestras. 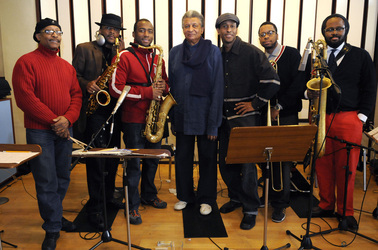 A documentary film, A Struggle for Love, about Abdullah Ibrahim’s life journey was made in 2004. His latest recording, Sotho Blue (Sunnyside), is a joyful and swinging performance by his current incarnation of Ekaya.